There is a lot of lousy stuff happening the world of immigration these days and, lord knows, the Obama administration deserves its share of the blame — mostly for its unfortunate kowtowing to the xenophobic right and its aggressive deportation of thousands of good people who pose no threat to our country. That said, there can be no doubt that the lion’s share of the blame for the current disastrous situation lies with those who stubbornly oppose comprehensive immigration reform that would provide a path to citizenship for “DREAM’ers” and millions who are here to stay while dramatically increasing the opportunities for legal immigration for Central Americans fleeing broken societies. But, of course, the not-so-thinly-veiled undercurrent of the letter is plain: the Guvs want Obama to make these kids go away ASAP. And naturally, the letter provides zero in the way of specifics as to how to do this — much less an endorsement of comprehensive immigration reform that is the only hope for making a dent. The bottom line: Gov. 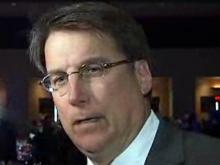 McCrory has more than enough policy crises of his own making to deal with in North Carolina. The last thing he needs to be doing is trying to tell President Obama what to do about an intractable issue like immigration reform when he can’t even control Art Pope, Phil Berger or Thom Tillis.